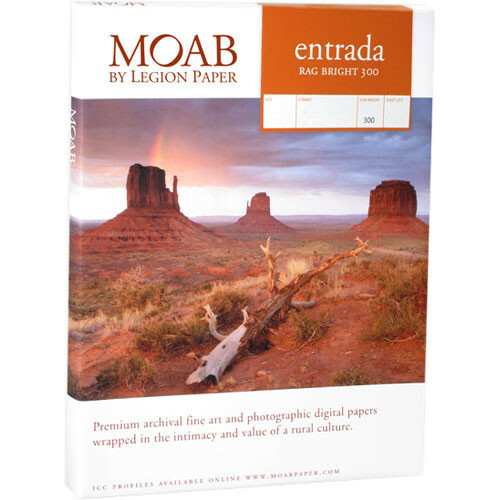 Sheet Size: 24 x 36"
Produce fantastic prints with vivid colors and high sharpness with the matte surface of Entrada Rag Bright 300 from Moab. Machine-made from 100% cotton fiber, this double-sided paper offers superb ink handling and a traditional feel. It also incorporates some optical brightening agents to reach a brightness of 103% and a whiteness of 95%. Also, the 22.5-mil thick sheets are acid and lignin free as well as water resistant and calcium carbonate buffered in order to ensure true archival longevity. This paper is available here as a 25-pack of 24 x 36" sheets. Box Dimensions (LxWxH) 37.7 x 25.8 x 1.6"